Three geeky tools in one. Prime number checker: For math lovers, determime if a number is a prime number. Al bhed translator: Al bhed is a language spoken by a race in the game Final Fantasy 10. This tool coverts from Al bhed to English and vice versa. 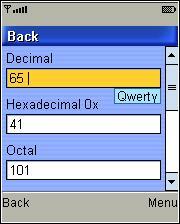 Programmer’s calculator , Binary / Hex / Octal / Decimal / ASCII converter: Convert between any of the formats. The app “Geek tools” (11 KB) is ready to download or send to your phone as filename:”GeekTools”.